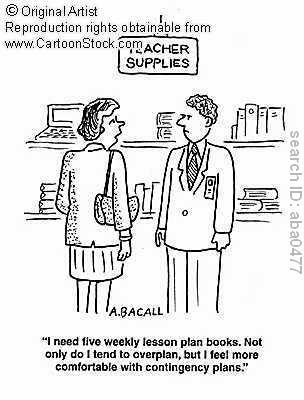 Do Teachers Over-plan Learning Opportunities? Teaching can be a difficult process, as we desire our students to get the most out of their learning. We want them to experience transformational changes, whereby they begin to change the way in which they “know” things (Kegan, 2008). We want them to challenge ideas, pose questions, and be creators. In order for this to happen, I believe students need to be actively engaged in their learning. Illeris (2008) defines learning as “any process that in living organisms leads to permanent capacity change (p. 7). Reflecting on this definition and my teaching practices, leads me to the assumption that I need to provide meaningful and relevant learning opportunities for my students. What would this look like in the classroom? Hands-on experiences, real-life situations, interest-driven products, and ideas in the creation realm come to thought immediately. But sometimes I wonder as teachers, do we over-think learning? Do we try too hard to create meaningful learning opportunities which instead result in a superficial experience? Wenger’s description of learning above made me think about a personal classroom experience. We had read the story Toto in class, where a timid Ugandan boy finds the courage to overcome his fears of going into the field, and ends up rescuing a trapped baby elephant. I always find that stories involving animals help children to develop a sense of empathy, but what I didn’t realize in this instance, was that my students would be outraged about the cruelty involved in hunting animals. What started off as a simple story, in which I had planned “meaningful learning activities” to occur afterwards, led to discussions of animals cruelty, conservation, education for others, and continued on to animals in the zoo and whether this was in fact another form of cruelty. My students then decided to have a debate about whether or not zoos should even exist. The point in me sharing this experience is that I think all too often as teachers we try to stretch learning experiences for our students. We want them to have great opportunities and in so we plan accordingly. But perhaps within a classroom environment that supports a culture of care and openness, and welcomes new ideas, learning will just happen. Illeris, K. (Ed.). (2008). Contemporary Theories of Learning: Learning Theorists…In Their Own Words. Florence, KY, USA: Routledge. Retrieved from http://site.ebrary.com/lib/alltitles/docDetail.action?docID=10296951 (Introduction, Chapters 1, 2, 3, 4, 14 and 15 [5 and 11]. This entry was posted in Approaches to Teaching and Learning, Environments Conducive to Student Learning, Meaningful Learning Activities and tagged learning, meaningful learning opportunities, transformative learning by ekpetley. Bookmark the permalink.